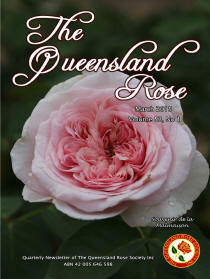 "The Queensland Rose" is the quarterly newsletter of the Queensland Rose Society and is one of the benefits of membership. It covers articles on activities, help with rose care, rose breeding, and even materials from International lectures on roses. The Newsletter is not available by email and is only available to members or affiliates of the Society. The four pages in the centre of the Newsletter are in colour. Download this sample for a glimpse at what you will receive as a member.